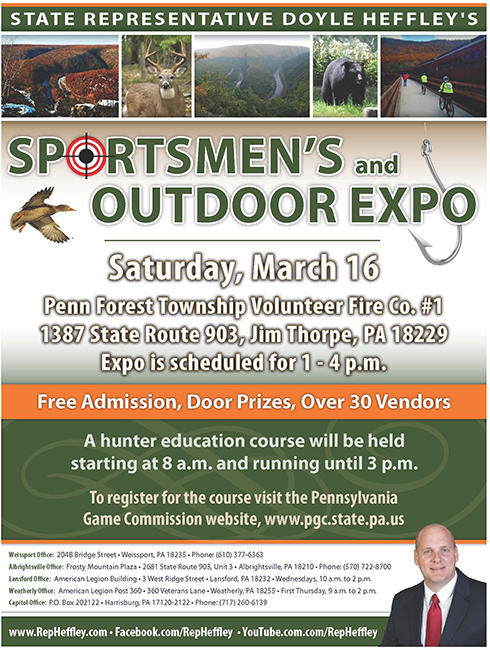 Our annual Sportsmen’s and Outdoor Expo will take place on Saturday, March 17, from 1-4 p.m. at Penn Forest Township Volunteer Fire Co. No. 1, in Jim Thorpe. This free event, which is always well attended, will include door prizes, informative exhibits and more. A hunter education course will also be offered at the expo. To learn more or to register for the class, click here. 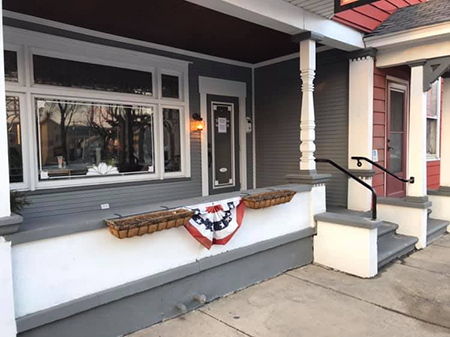 This was the first week of operation of my new district office, located at 204 Bridge St. in Weissport. I would like to thank everyone for your patience as we made the move. Hats off to my staff for working all last week to get the office ready. Special thanks to Jay Frey for providing us with a great location to serve the residents of Carbon County. 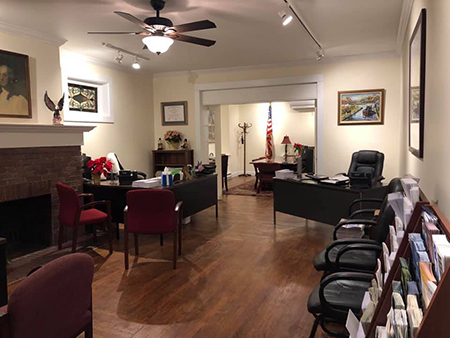 I’d also like to give a shout-out to Jeff Elder for helping to get us in the office a few days ahead of schedule, as well as Weissport Borough Council and area residents for the warm welcome. We love it here! What a pleasant surprise on Thursday when one of our new neighbors showed up with a cake and a card! Thank you, Anita Wisler, and everyone who signed the card for making us feel so welcome in our new home. Certified AARP TaxAide volunteers are available to provide free tax form assistance to moderate- and low-income taxpayers over age 60. To receive help filing 2018 federal, state and local tax returns or PA property tax and rent rebate applications, taxpayers must bring copies of their 2017 tax returns plus all income information, real estate tax receipts, any deduction information and health care enrollment information pertaining to 2018. Tax help will be available during the times and days listed at the following locations in our area from February through April. No appointment needed, just sign in as you arrive. 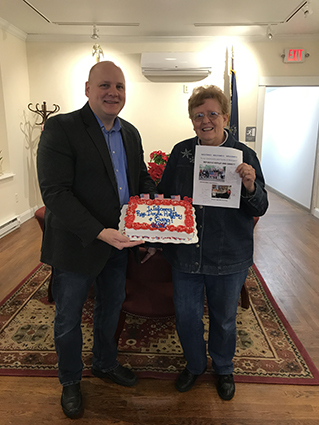 Palmerton Senior Center, 501 Delaware Ave., Mondays, 12:30-3:30 p.m.
Lehighton Senior Center, 243 S. 8th St., Tuesdays, 9 a.m. to noon. Beaver Meadows Borough Hall, 100 E. Broad St., Wednesdays, 9 a.m. to noon. Penn Forest Township Hall, 2010 Route 903, Wednesdays, 9 a.m. to noon. Gilbert Salem UCC, Long Mountain Road and Route 209, Thursdays, 9 a.m. to noon. Weatherly Senior Center, 335 Third St., March 1 only, 9 a.m. to noon. Gov. Tom Wolf delivered his budget proposal for the 2019-20 fiscal year before a joint session of the General Assembly on Tuesday. House Republicans have been, and will continue to be, leaders when it comes to education funding, having increased spending for PreK-12 education by $3.4 billion since 2011. We will also continue our commitment to building the economy through a better tax and regulatory climate, as well as ensuring our students are trained for the jobs of today and tomorrow. We are equally committed to removing the barriers to employment and self-sufficiency. The budget process continues next week with the first in a series of House Appropriations Committee hearings, which I will be attending as a committee member, to delve into the details of the governor’s plan. For a schedule and live streaming of the hearings, visit www.pahousegop.com. High school seniors interested in receiving financial assistance to help pay for college can now apply for a Pennsylvania House of Representatives Scholarship. Each year the program awards four-year scholarships to two students preparing for post-secondary education. The scholarship is privately funded by individual and corporate donors; no tax or other public funds are used. Students must have attained a minimum 3.0 cumulative grade point average in high school in order to be eligible for a scholarship. Other factors taken into consideration for the awards are a student’s commitment to community, leadership qualities, extracurricular activities and financial need. The application deadline is March 1, 2019. Learn more here, including how to apply.